Something Different! TWO (2) Ozone Output Ports! It's almost like having 2 Ozone Generators in one! 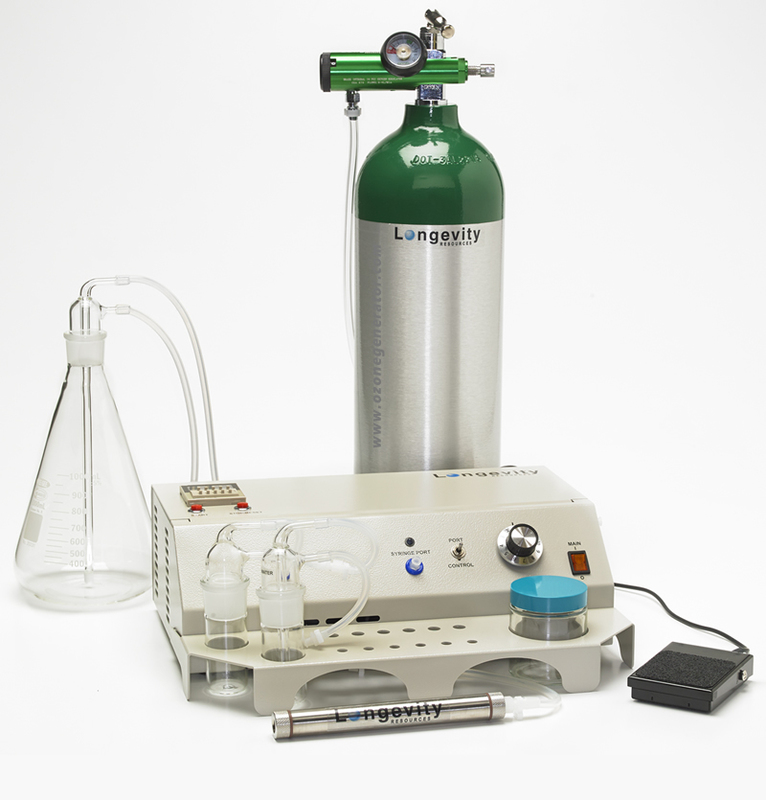 The Quantum 3 Ozone Generator, winner of the "Best Product of the Year" award at Dental Product Shopper, is designed to produce UltraPure Contaminant Free Ozone for any and all ozone protocols, and is the ONLY ozone generator on the market with 2 Ozone Output Ports for added value and convenience. It is the only Ozone Generator you will ever need. Plus, with "Quality Auditing Institute's" Quality and Safety Approval to CSA and UL Standards, we've proven it's high Quality. Unique! This is like having two ozone generators in one! Take care of two ozone protocols at the same time without disconnecting from the generator. For example ozonate water with the Syringe Bypass and still have the main "Syringe Port" free for another applications! "On Demand" Ozone Port on the front panel releases ozone only when you push the "Port Control" switch or depress the Remote Control Foot Pedal (for hands free operation). The Second Port (Syringe Bypass) is also available for all protocols. Longevity's 100% Quartz Glass Electrode produces pure ozone free of contaminants because glass ensures the ozone never touches any metal, ceramics, plastic, rubber, glues, nor resins. We have Proof of Purity through independent laboratory testing. Isn't PURITY what it's all about? In 1995 we set out to build Ozone Generators that last a Lifetime. 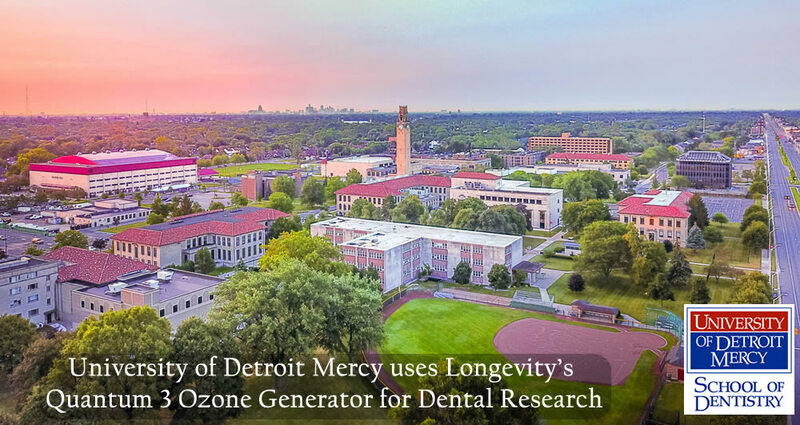 Today...Longevity Ozone Generators are still in use 20+ years after they were purchased. Now THAT's Reliability and Quality! Buy one ozone generator, then buy another only if you need to expand. That's Value! Quantum 3 Ozone Generator...with Two (2) Ozone Output Ports! ...Almost like having 2 Ozone Generators in One! While One Ozone Output Port is occupied for water, sauna, or other Long Term Ozone method, the "Syringe Port" remains available for you to fill syringes, bags, etc. Two Ozone Output Ports make Longevity's Quantum 3 Ozone Generator the most versatile Ozone Generator on the world market today. While the "Syringe Bypass" ozone output port is in use for a 'long term' ozone protocol such as ozonating water, saline, oils, or for Ozone Sauna, the "Syringe Port" remains available for you to access pure ozone any time, such as for filling a syringe. The Safe, easy, accurate delivery of the ozone is guaranteed by the front panel mounted "On Demand" Ozone Output Port. The ozone is only released when you depress the "Release" toggle switch or depress the Remote Foot Switch. Talk about convenient! The Quantum 3 Ozone Generator is manufactured in North America using North American Components and workmanship, incorporating the world's most advanced ozone engineering and design...a winning combination. Longevity Resources Inc. has once again set the "Gold Standard" for quality ozone systems, and provides you with proof of this quality before you ever buy the system. QAI (Quality Auditing Institute) has inspected the Quantum 3 and our factory for you, and have provided them with the leading Quality Awards of CSA and UL Approval. We have proven quality....no wonder Longevity ozone generators have the reputation of running reliably for over 20 years! We display our commitment to you, our valued customer, through our Lifetime Warranty, and our phenomenal reputation for providing unequaled Customer Support. You'll be happy you teamed up with Longevity! Welcome to the family! PHENOMENAL BENEFITS AND PHENOMENAL FEATURES? Safety and Quality Tested to CSA, UL, and CE Standards! Rigorous third party testing at the QAI Laboratories (Quality Auditing Institute) proves to you, without a shadow of a doubt, that the Quantum 3 Ozone Generator is extremely high quality and reliable. No wonder customers have found our ozone generators last 20+ years without fail! Longevity is the only company, in the world (!) to prove that our ozone is pure! Independent laboratory testing proves, without a doubt, only the highest level of purity. This level of purity is only possible due to the fact that only Longevity uses a 100% Quartz Glass lined Electrode which ensures the ozone never touches any metal, ceramic, rubber, plastic, glues, resins, nor any other material that would otherwise contribute contaminants to the ozone gas. Each Quantum Ozone Generator is tested for Ozone Output using the Oxygen Regulator that is being provided with the ozone generator. This gives the Ozone Output Report an unequaled level of precision, taking into account that no two Oxygen Regulators are identical. Premium Ozone Technology (see below) ensure that you can trust that the Ozone Concentration levels will remain accurate long term. International Experts at the ISCO3 (International Scientific Committee of Ozone) state publicly that the "Best material from which to make ozone electrodes is Quartz Glass". Ozone destroys all metals, ceramics, plastics, rubber, glues, resins and the byproducts of that destruction contaminate the ozone. Quartz Glass is 100% ozone resistant which enables us to avoid all contact with those other materials and guarantee you Pure Ozone! How many North American Ozone Generators have won awards? ONE! The Quantum 3 Ozone Generator won "Best Product of the Year" from "Dental Product Shopper", North Americas largest dental product review magazine. It's used by thousands of dentists in the USA who rated it higher in quality, reliability, and results, than any other product in their office with an "Overall Satisfaction" score of 4.9 out of 5 (98%!!). "It's almost like getting 2 ozone generators in 1". The Quantum 3 is the only ozone generator in the world with 2 Ozone Output ports which doubles your access to ozone. For example, if you are busy ozonating water or saline with one port (or feeding the ozone to the Ozone Sauna) and you need to fill a syringe or bag with ozone, no problem...the "Syringe Port" is still available for your use. Double protocols, double convenience! There will come a time when you would like to release ozone from the Output Port but your hands or full, or you are wearing gloves and your hands are sterile. How do you get the ozone generator to release ozone? Simple; step on the foot pedal to open the "Syringe Port" and out it comes! Hands free operation is phenomenal for both the professional, and also the lab technician using the Quantum 3 Ozone Generator (or the Quantum 5). Run the Quantum 3 24 hours per day 7 days a week if you want to! Ultimate Quality = Ultimate Reliability. Longevity is committed to providing you with only the highest quality electrical components coupled with state of the art circuit designs to create NEOS Technology - the most advanced ozone technology available in the world today. Highest quality components and cutting edge design ensures reliable worry free operation of your ozone system for many years to come. That's the Longevity way! 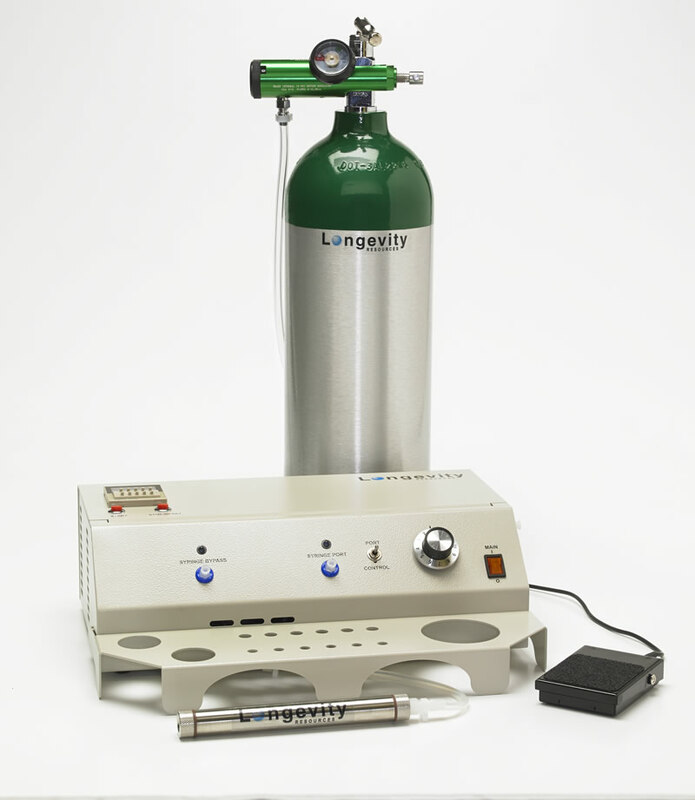 Longevity's Quantum 5 and Quantum 3 are the only North American ozone generators on the market with "On Demand" Ozone Output Ports. No ozone escapes the port until you activate the port by depressing the Toggle Switch, or by activating the Remote Control Foot switch. Whether you are filling a syringe, a bag, or sending the ozone to the destination through attached tubing, YOU are in complete control! The Quantum 3 Ozone Generator offers the widest range of ozone concentrations in the world providing over 90 choices of "Micro Ozone" levels of less than 1 ug/ml through to an amazing 120 ug/ml ozone concentration. Rest assured you will be able to perform any ozone protocol from anywhere in the world. Automate your protocols. "The built in timer is like an extra set of hands, or an extra employee (that we don't have to pay!)" said one Longevity customer. Set the timer to turn off the ozone production for you, so you don't have to constantly watch the time. The built in digital timer will ensure that the ozone runs only as long as it is supposed to, then automatically shuts off the flow. The attractive powder coated all metal cabinet protects all of the interior components of the Quantum 3 Ozone Generator on the inside, and also protects and shields YOU by ensuring no EMF fields reach the outside. This durable and attractive metal cabinet is just one more reason to trust the legendary high quality of Longevity products, which are proven to be high Quality and Safe through Quality Auditing Institute Laboratories. After more than 20 years in business, you can certainly earn a reputation! Longevity is known for "Legendary Customer Support". Our focus on providing clear, friendly, customer support has earned us the reputation of taking exceptional care of customers. You are not alone, as our Customer Support Team are always here to assist you with your questions with no expiry date, and no charge. Longevity includes a Lifetime Warranty on our 100% Quartz Glass Electrode against any burn out or manufacturing defects, plus a 5 Year Warranty on all other electrical components. With ozone generators on the market that have been operating reliably for over 20 years without fail, you know you can trust a Longevity ozone generator to serve you well. The Quantum 3 Complete Ozonation System comes with accessories to ensure you can perform virtually all of the popular ozone application methods. Longevity Resources Inc. Product Specialists are happy to speak with you to help you to customize this or any of our Ozone Generator Packages to ensure that you have a package that meets your needs, and your budget. Our staff are selected for this position at our company because they love helping people, are patient, and kind. Feel free to call our office or email any time for assistance in customizing any package. Our team is here to help you. Start With Just a Few Accessories; Add More When You Need Them! The World's only "2 Ozone Output Port" ozone generator!...like having two ozone generators in one! Talk about Value! The "On Demand" Ozone Output Port right on the front panel. No cumbersome external equipment necessary! The second port allows dual simultaneous ozone protocols. Rigorously laboratory inspected by Quality Auditing Institute to North American CSA and UL Standards. CE Approved to European Standards. QAI also inspects the Longevity factory 4 times per year. Longevity doesn't just tell you our products are high quality...we prove it! Purest Ozone Available...in the world! International unbiased experts from the ISCO3.org say: "The best material from which to make ozone electrodes is Quartz Glass". Longevity's electrodes are double walled quartz glass! This is the ONLY way to create pure ozone free of contaminants - and we've proven that with our purity report. Lifetime Warranty on Cold Corona Glass Electrode; 5 Year Warranty on all electronics. 30 Day Money Back Return Policy. Over the past 20 Years Longevity has built a reputation for high quality reliable products that function for....20 years! Relax, you're using Longevity products now! 4" H x 7" Wide x 13" Long (102 mm Hx 184mmW x 330mm L) Small but mighty! One of the smallest Table Top Ozone Generators in the world. Weighing in a only 7 pounds (3 kgs) the Quantum 3 Ozone Generator is ideal for Table Top use, mount it on any shelf on the wall, mount it vertically on the wall, or place on a shelf on a movable cart or pole. The All Metal cabinet protects the Quantum 3 wherever you use it. 110 - 120 Volt AC 60 Hz 0.4 Amps. Also 220 - 240 Volt 50 Hz 0.2 amps. Use the Quantum 3 in any country in the world. Lowest amperage on the market, lowest electricity consumption => runs cool, accurate, and inexpensively. All metal cabinet not only acts as shielding from any and all EMF fields but is also extremely durable and high quality. No cheap plastic here! Customize to your Needs and Budget! Longevity manufactures the widest range of high quality Ozone Accessories on the world market today. Customize your Ozone Package to include the accessories that suit your needs! We ship the Quantum 3 Ozone Generator Worldwide on a daily basis. Product is in stock and ready to ship immediately to all worldwide destinations. Order today!